Nightingale encourages the independence of our elderly clients while enabling them to remain active with their community and family. Home health care for the aging and chronically ill in the UAE is quickly becoming the preferred solution for the growing elderly population. When provided the opportunity, most senior citizens prefer to live out their later years in the comfort and familiarity of their homes. With the help of a licensed medical professional, they can avoid having to move to an unfamiliar assisted living facility. There are many benefits to obtaining home care for the elderly. From companionship to promoting aging with dignity, home care has multiple benefits. 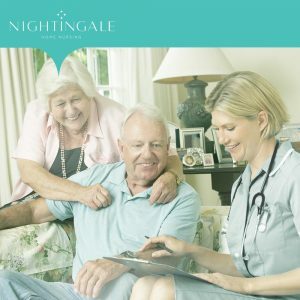 Here at Nightingale, we have compiled a list of the top reasons why you should use home care to take care of your elderly relatives and loved ones. When your loved one receives medical care in their home, the caregiver’s only responsibility is to provide compassionate, quality care for your loved one. This means your aging parent or loved one will have the complete, undivided attention of their caregiver. With a Nightingale caregiver, implementing care for the elderly is an individual, personalized affair. Your loved one receives one on one care at the necessary level to make them completely comfortable and safe. A registered in-home nurse provides professional quality care and medical assistance. When compared to nursing homes and assisted living facility fees, they are an extremely affordable care option. On average, caring for your elderly loved ones in their home costs far less per hour than it would to admit them to a local elderly care home. Additionally, most reputable care providers in the UAE do not require the use of monthly or annual contracts. You simply enlist their services if and when you need them. When you bring a professional, preferred caregiver into your loved one’s life, you’re doing more than securing premium care for their health and wellbeing. You’re also guaranteeing the peace of mind that comes with knowing your elderly loved one is properly cared for. As our loved ones age, it becomes increasingly difficult to provide the range and level of health care they need and deserve. Taking advantage of a professional in-home nursing care not only bolsters their love and support with professional, quality care but also enables you to spend your time enjoying their company without the pressures of providing for their care. During difficult times, such as illness or old age, a powerful family bond can make all the difference in the world. Families provide a stable foundation for the emotional support of their elderly loved one. Knowing that your loved one is in an environment where they feel safe and secure is worth its weight in gold. Those who choose home care for the elderly over assisted living facilities and nursing homes experience the advantage of visiting their family members whenever they wish, without the restrictions of visiting hours. Additionally, home care providers are devoted to involving family members in the care process of their loved one. Perhaps the most important aspect of home health care resides in the fact that home care promotes an environment of independence, comfort and confidence for the elderly. This allows them to recover faster and grow old with dignity. The home environment is the least restrictive place for older adults to remain engaged with their typical daily activities in the community and with family and friends around them. With a range of home care services, your loved ones have the control and the ability to lead a meaningful and independent life well into old age. Home care services can range from medication reminders and bathing/showering helping with daily chores, meal preparation, and grocery shopping. Additionally, Nightingale nurses are licensed by the Dubai Health Authority (DHA). DHA registered nurses are qualified to administer medical care and treatments and are trained in extensive first aid techniques. At Nightingale, our DHA registered nurses are trained in first aid, safety procedures and emergency response. We encourage the independence of our elderly clients while enabling them to remain active with their community and family, and would love to do the same for your loved ones too! I love how you said that a benefit of senior in-home care is knowing that your loved one is in a place where they feel comfortable. Having the freedom to come and visit them whenever you want would also be really nice. That way you could keep a strong connection with that family member regardless of how sick they get. I do agree with you when you said that family offers a powerful emotional support that can make all the difference in the world to the elderly, so it is beneficial for the family to stay close and hire in-home care provider instead. I will mention this to my parents since they also seem to be against the idea of giving my grandpa away. I know that at his age, what he needs the most is us, so I feel strongly that we should keep him with us and just hire a professional to assist him. Thanks! I appreciated it when you said that by hiring home care providers, I can spend quality time with my loved one without having to do all the necessary care that they need. Of course, I do not want to try and care for my grandma then end up making a mistake. But I also do not want to be separated from her. So hiring a home care provider is the best option. sure. I do agree that homecare has much benefit for old people. Thanks for interesting post. I have to agree with you that in-home care will give me the peace of mind knowing that my grandma is receiving the kind of care that her condition needs. Aside from this, I know that the attention of the caregiver is solely on her, so the treatment is specialized. I will consider this since I do not want to be separated from my grandma anyway.